Oppo's All-Brand Reality has launched its new smartphone Reality 3 in India. Launching of the phone took place on March 4 in an event held in New Delhi. 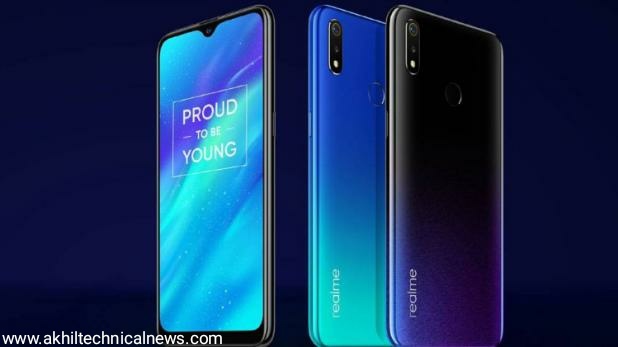 Talking about the features of this phone, Realme 3 will have a dual-rear camera and large battery processor the Waterdrop Notch Display. Reality also gave information about Reality 3 Pro besides Realme 3 and said that this phone will be launched in April. Realme 3 Pro will be launched with a 48-megapixel camera and Qualcomm Snapdragon 675 processor. This phone will get Android Pie 9.0 based ColorOS 6.0 with dual sim support. Apart from this, the phone will get a 6.2 inch HD display, which will get Gorilla Glass 3 protection. Apart from this, this phone will get 3 GB / 4GB RAM and 32GB / 64GB of storage. This phone will get Mediatech's Helio P70 processor. Talking about the camera of the phone, it has a dual rear camera in which one camera is 13 megapixels and the other is 2 megapixels, while the front camera is 13 megapixels, which is the aperture F 2.0. In this, you will also get Face to unlock. Apart from this, the phone has a 4230 mAh battery, which supports fast charging, a 10-watt charger will be available in the box. The phone has dual 4G support and three card slots for connectivity, one for memory and two sims. There is also a fingerprint sensor on the back panel of the phone. The price of 3 GB RAM and 32 GB storage variant for this phone is 8,999 rupees and 4 GB RAM with 64 GB storage variant worth Rs 10,999. The first cell phone from the Flipkart will be held at 12 noon on March 12. With this, customers will benefit from Rs. 5,300 on behalf of Geo. Also, a payment of Rs 500 will be given for payment from HDFC card.